This is a sponsored post brought to you by Bob’s Red Mill. All thoughts and opinions expressed herein are my own and not influenced in any way by the sponsor and/or its affiliates in any way. The holidays are my favorite time of year for doing something special for those I love. My girl friends and I have a yearly tradition where we bake something homemade, then show up at each other’s homes randomly to drop off our delicious gifts. There’s nothing like the feeling of knowing that someone cares enough to take the time and make something special for you. In this hectic world we live in, it’s important to slow down once in a while, and take the time to tell those you love that you are thinking about them, and that they matter to you! After all, what are the holidays about, if not celebrating family, friendship, love and gratitude? 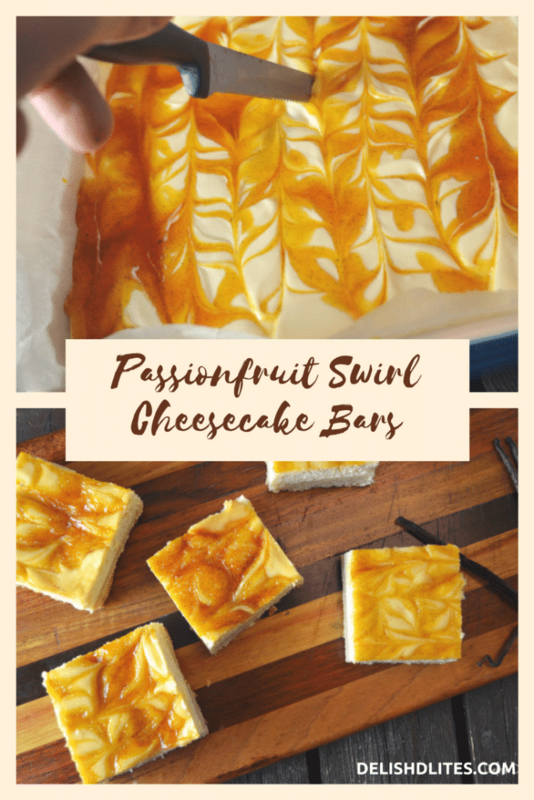 This year, I’m honoring my Puerto Rican heritage with this tropically inspired treat, Passionfruit Swirl Cheesecake Bars! 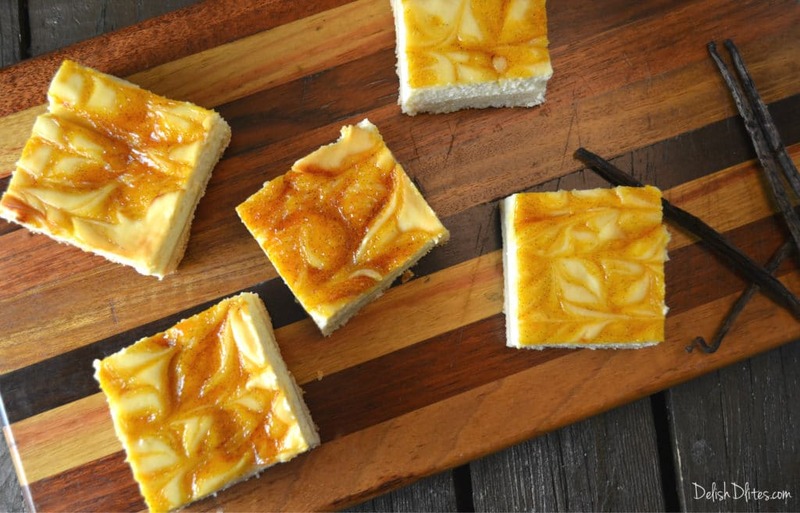 These cheesecake bars are the perfect dessert to share with friends and family, and the exotic flavor of passionfruit is something they’ll be talking about way after the bars have been devoured. 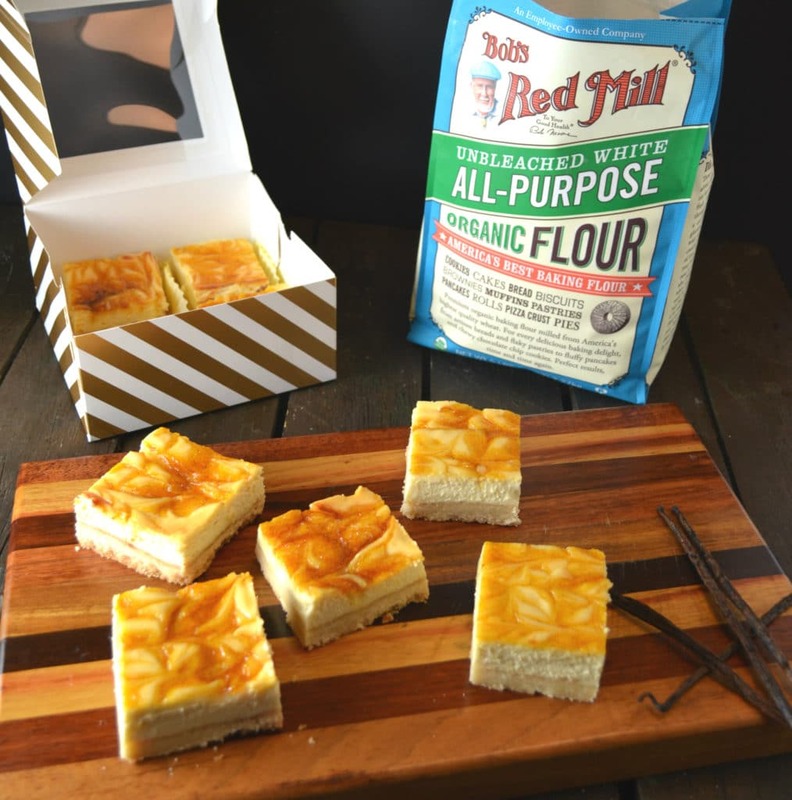 When it comes to my baked goods, I trust Bob’s Red Mill products, which are of the highest quality and really allow baked goods to shine in all their glory. What I also love about Bob’s Red Mill is their philosophy of making our world a better place through small acts of kindness. I’ve always been a lover of cooking because power that it has to bring people together. 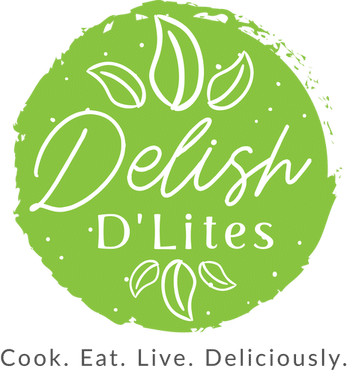 Cooking for others creates community, and with community comes feelings of connection and happiness. 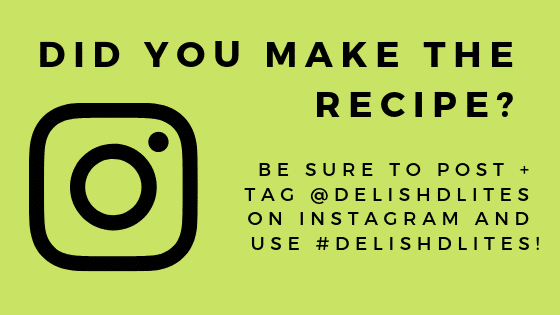 So take some time this season to show a little love, and be inspired to perform small acts of kindness by taking the time to share something homemade with someone you, I promise you won’t regret it! To make the passionfruit swirl, combine the passionfruit pulp, sugar and vanilla bean (if using) in a small saucepan. Bring the mixture to a boil to dissolve the sugar, then lower to medium heat and cook the mixture until it is thick and syrupy. You should end up with about ¾ cup of passionfruit syrup when it’s done. Pour into a heat-safe container and refrigerate until needed. To make the shortbread crust, combine the flour, butter and 1/3 cup of sugar in food processor or mixer. Mix until the dough is completely smooth. 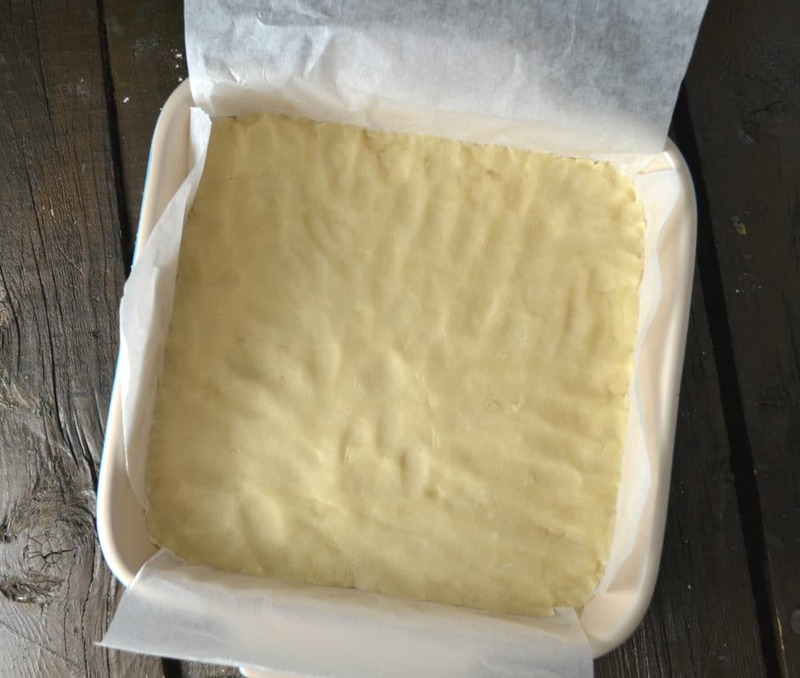 Line a 8×8 baking dish with parchment paper, then press the dough into the bottom of the dish into an even layer. Prick the dough with a fork several times, then bake at 350°F for 15-25 minutes, until the dough is lightly golden on the edges. Meanwhile, combine the cream cheese, eggs, sugar, sour cream and vanilla in a food processor or mixer, and blend until smooth. Once the crust is baked, pour the cheesecake mixture on top and smooth it out with a spatula. Pour a few lines of the passionfruit syrup on top, then swirl with a knife or toothpick. Bake the cheesecake bars at 325°F uncovered for 30-40 minutes, until the edges are slightly puffed and golden brown, but the center is just ever so jiggly. Refrigerate the bars for 4 hours, or overnight. 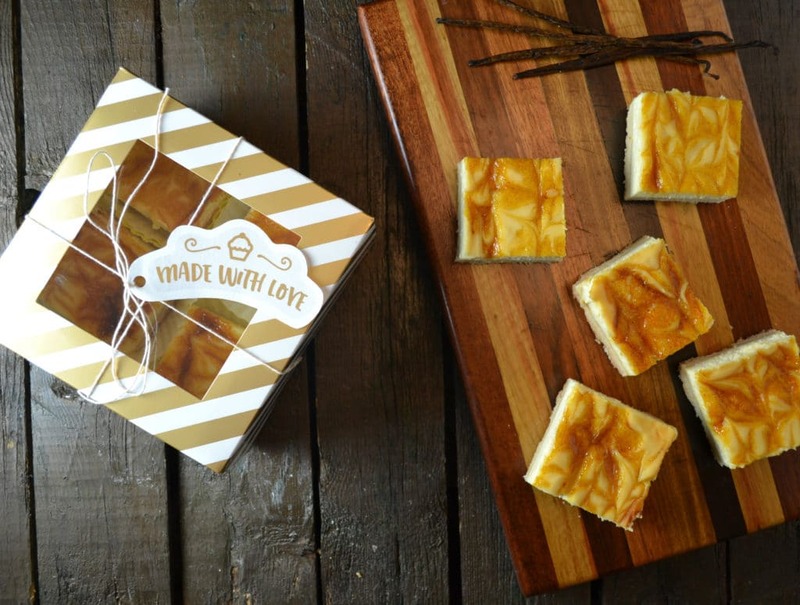 I cut my bars into 9 squares for a generous portion, but you can also do 12 pieces for slightly smaller bites. 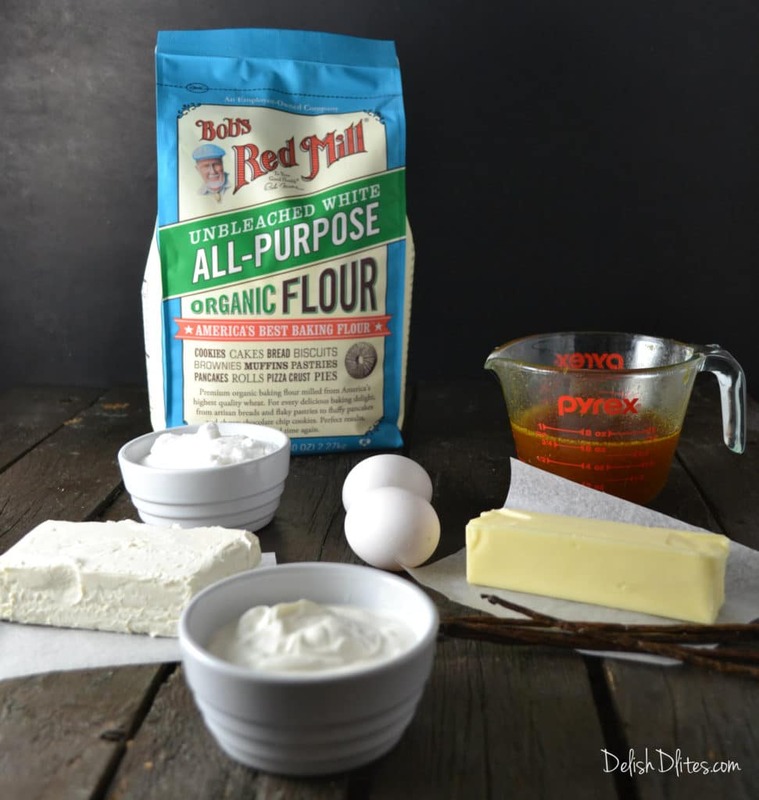 Click here for a $1 off coupon for your favorite Bob’s Red Mill products, they offer lots of different products for creating your favorite treats at home. Combine the passionfruit pulp, sugar and vanilla bean (if using) in a small saucepan. Bring the mixture to a boil to dissolve the sugar, then lower to medium heat and cook the mixture until it is thick and syrupy. You should end up with about ¾ cup of passionfruit syrup when it’s done. Pour into a heat-safe container and refrigerate until needed. 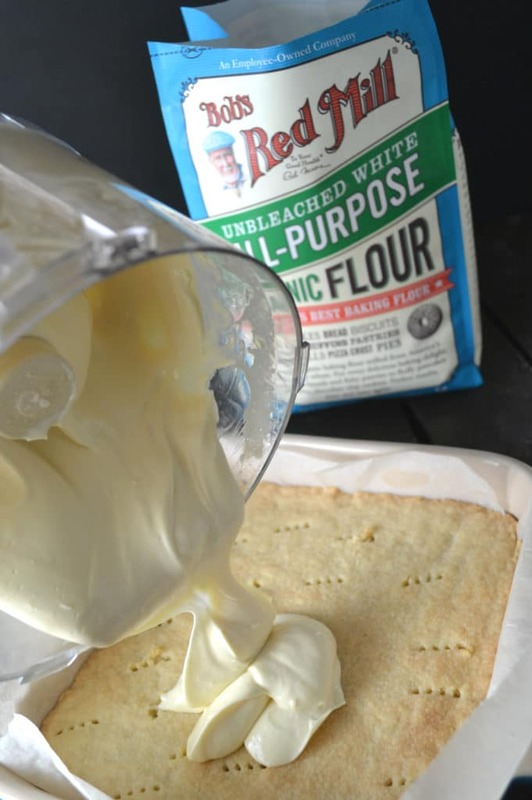 Combine the flour, butter and 1/3 cup of sugar in food processor or mixer. Mix until the dough is completely smooth. Line a 8x8 baking dish with parchment paper, then press the dough into the bottom of the dish into an even layer. Prick the dough with a fork several times, then bake at 350°F for 15-25 minutes, until the dough is lightly golden on the edges. Meanwhile, combine the cream cheese, eggs, sugar, sour cream and vanilla in a food processor or mixer, and blend until smooth. Once the crust is baked, pour the cheesecake mixture on top and smooth it out with a spatula. Bake the cheesecake bars at 325°F uncovered for 30-40 minutes, until the edges are slightly puffed and golden brown, but the center is just ever so jiggly. 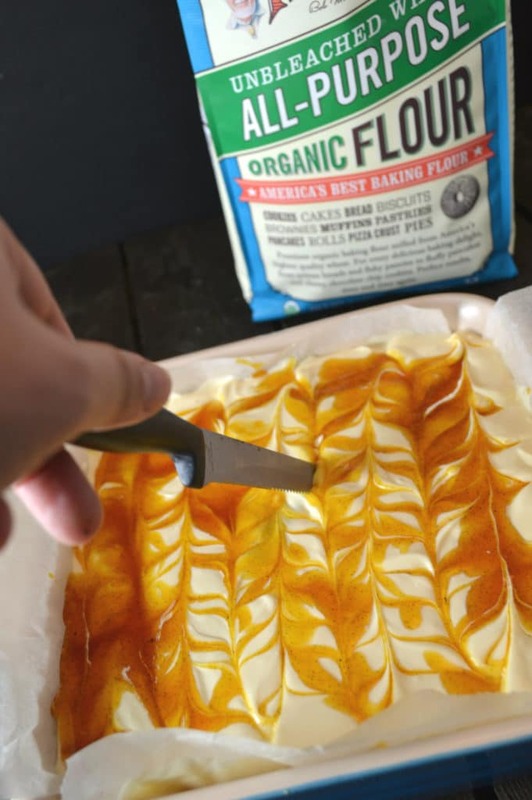 Refrigerate the cheesecake bars for 4 hours, or overnight. 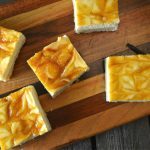 Once cooled, cut the bars into 9 squares for a generous portion, but you can also do 12-15 pieces for slightly smaller bites.